Despite officially focusing on increasing low-income student accessibility at Cal Poly, President Jeffrey Armstrong has said that an indirect goal of the Cal Poly Opportunity Grant (CPOG) and the associated Cal Poly Opportunity Fee (CPOF) was to increase ethnic diversity. This poses the question: How is low-income accessibility related to ethnic diversity? At an Associated Students, Inc. (ASI) board meeting Feb. 7, Armstrong spoke to the ASI Board of Directors about the CPOG and CPOF and how it aims to improve Cal Poly’s accessibility to low-income students. At the meeting, College of Engineering ASI Director and mechanical engineering senior John D’Ambrosio requested Armstrong clarify the purpose of the grant and fee, citing “blurred lines” between economic and ethnic diversity as presented by Armstrong. Thus, although the explicit goal of the fee is to increase low-income accessibility, the indirect byproduct would be to increase ethnic diversity, according to Armstrong. During a Q&A session on diversity and inclusivity with Mustang News in April, Armstrong explicitly stated that part of the Opportunity Grant’s mission was to attract more students of color to Cal Poly without violating state law on affirmative action — specifically Proposition 209. Proposition 209, titled the “California Civil Rights Initiative,” passed in 1996 and bans public colleges and universities in California from considering race when granting admission and financial aid. However, this does not prohibit granting need-based aid like the proposed Opportunity Grant. According to California State University (CSU) system data, in Fall 2017, Cal Poly had the highest proportion of white students in the CSU system at 54.8 percent of the student body in comparison to the system-wide 23.5 percent. Additionally, Cal Poly had the lowest proportion of Latinx and Black students in the CSU system at 16.7 percent and 0.7 percent respectively. The composition of the first-time freshmen class of Fall 2017 was similar to the overall Cal Poly average, with 54.1 percent identifying as white, 17.8 percent identifying as Latinx and 1 percent identifying as Black. However, according to preliminary admissions data obtained by The Tribune, the proportion of white students in the incoming freshman class of Fall 2018 has increased to 58 percent. Meanwhile, the proportion of Latinx and Black freshmen decreased to 14.9 percent and 0.4 percent respectively. There is speculation that an incident involving a former member of Lambda Chi Alpha donning blackface during a brotherhood event April 7 negatively impacted admission offer acceptance rates among accepted applicants who identify as minorities. In comparing economic factors with ethnic diversity, Mustang News examined a number of factors: net cost for low-income students, commuter-friendliness and locale. 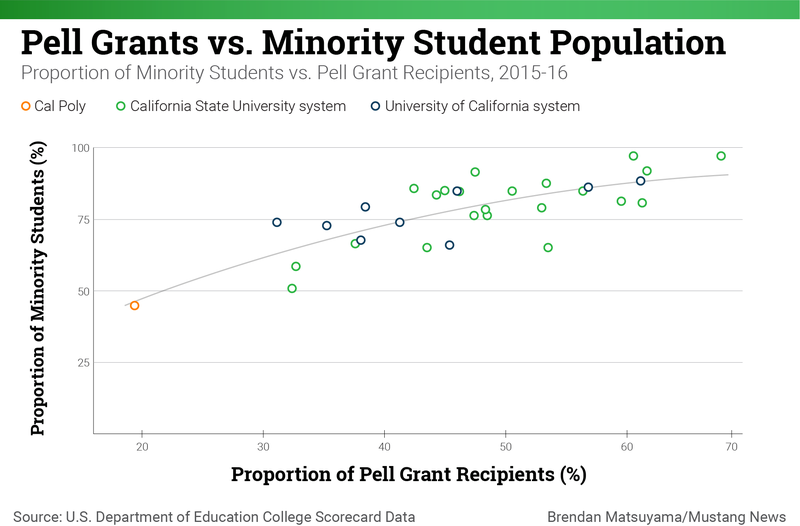 Further, Mustang News compared the proportion of students who received Pell Grants with the proportion of incoming freshmen who identify with ethnic minority groups. Cal Poly has the second-highest net cost for low-income students from families making less than $30,000 per year in the CSU system and third for all public universities in California. Cal Poly’s net cost of $10,569 in 2015-16 is calculated after factoring in all estimated costs offset by financial aid and discounts by the U.S. Department of Education (DOE). With the CSU system average at $6,720, Cal Poly is 57.3 percent more expensive for low-income students. There is a statistically significant correlation between cost for low-income students and the proportion of the student population who identifies as a certain ethnicity. 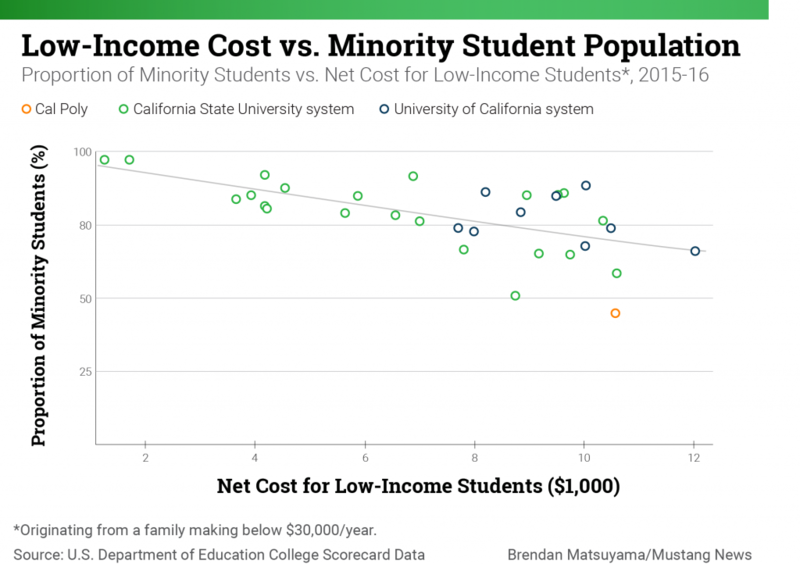 In 2015-16 across public universities in California, for every $1,000 increase in net cost for low-income students, the proportion of non-white and Latinx students in the incoming freshman class decreased by 2.6 percent and 4 percent respectively. Students from low-income families are more likely to be financially independent from their families and typically take on more debt than other students. Overall, during the 2015-16 academic year, only 6.5 percent of Cal Poly students from all incomes were financially independent, while 87.5 percent of students from families making less than $30,000 per year were, according to the DOE. 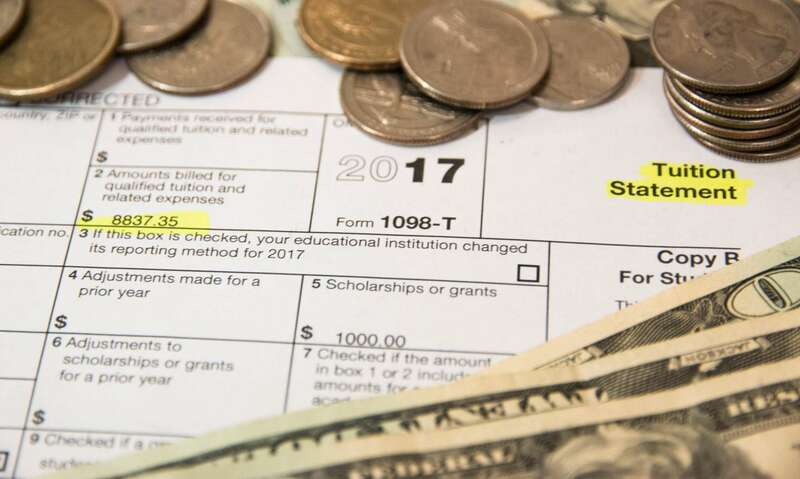 Cal Poly’s average family income for financially independent students receiving Title IV aid was $13,300, according to the DOE. Meanwhile, the average family income for financially dependent students was $99,258. Thus, low-income students were more likely to be financially independent from their parents than high-income students, but only approximately one in 15 students is financially independent. Further, financially independent students tend to have higher debt than dependent students, according to DOE data. The median debt for independent students was $18,000 for this time frame, versus $16,023 for dependent students. Pell Grants are federal grants awarded to students based partly on need and cost of attendance which do not need to be repaid, according to the DOE. Awards are based partially on adjusted gross income (AGI) and the number of dependents within a family, and approximately 96 percent of Pell Grant recipients during the 2007-08 academic year had AGIs of less than $50,000 per year, according to a Forbes report. For the 2018-19 academic year, the maximum Pell Grant award amount will be capped at $6,095, which is about 21.5 percent of Cal Poly’s total estimated cost of attendance for in-state undergraduates. 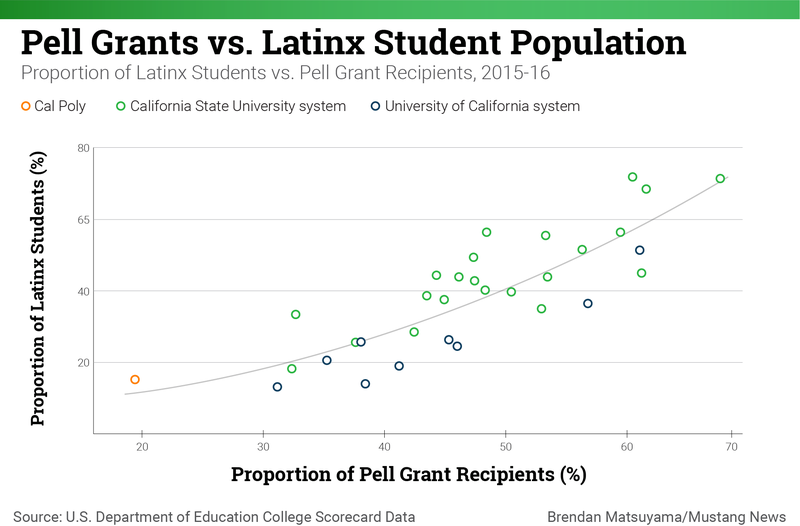 There is a nearly one-for-one relationship between the proportion of students at public universities in California who receive Pell Grants and the proportion of students who identify as Latinx and non-white. Based on College Scorecard data, for every 1 percent increase in students who received Pell Grants, the proportion of Latinx and non-white students in general increased by 1.3 percent and 0.9 percent, respectively, during the 2015-16 academic year. In 2015-16, Cal Poly had the lowest proportion of Pell Grant recipients of any public university in California at 19.4 percent, according to College Scorecard data. For the same academic year, Cal Poly’s incoming freshman class had the lowest proportion of non-white students for a public university in California at 45 percent of new students. Additionally, Cal Poly had the third-lowest proportion of Latinx students at 15.4 percent in its incoming freshman cohort, just behind University of California, Berkeley (13.4 percent) and University of California, San Diego (14.1 percent), according to data published by the CSU and UC systems. Based on CSU system estimates of total cost of attendance by campus for 2018-19, Cal Poly will be $8,421 more expensive for students living on-campus or off-campus than students who live with their parents and commute. However, Cal Poly requires freshmen to live on campus and in the past has voiced its intention to eventually require sophomores to live on campus. The average cost of attendance for low-income students during the 2015-16 academic year for schools with mandatory on-campus housing requirements for non-local first-time freshmen was $8,207, versus $5,926 for schools that lacked such a requirement. Additionally, the proportion of non-white students at CSUs with mandatory freshman housing was 71.6 percent, versus 81.8 percent at schools without the requirement. Even for students who do live with their parents and commute, Cal Poly will have the second-highest estimated cost in 2018-19 at $19,551 compared to the CSU average of $17,589. The only school with a higher estimated cost was Cal Maritime which is the smallest CSU and includes atypical expenses such as mandatory medical insurance and uniforms. Cal Maritime had the second-lowest proportion of minority students in its Fall 2015 incoming freshman class after Cal Poly. Only 6.8 percent of incoming freshmen in Fall 2016 originated from the Central Coast, according to Cal Poly Institutional Research. Based on U.S. Census Bureau data from 2010, fewer people live within 50 miles of Cal Poly than all but one CSU, due in part to it being situated in a small suburb as defined by the DOE. Further, according to the U.S. Census Bureau, in 2016 only 30.3 percent of those living in San Luis Obispo County identified as non-white or white Hispanic, compared to the 62.6 percent for the entirety of California. For comparison, 75.4 percent of all CSU system students identified as an ethnicity other than white the same year, compared to only 43.6 percent of Cal Poly students, according to the CSU system. According to a Cal Poly study, off-campus rent in San Luis Obispo is an average of $1,256 per month. In comparison, the average monthly rent for Cal Poly’s cheapest housing option for first-time freshmen during the 2018-19 academic year (a three-bedroom in a residence hall) will be approximately $785 per month. The average monthly rent for Cal Poly’s most expensive housing option (a two-bedroom in yakʔitʸutʸu) will be $908.50. 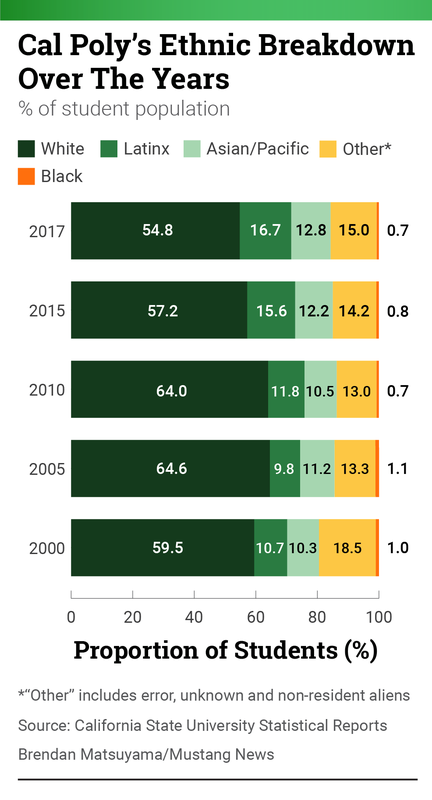 The median income of Cal Poly graduates who were born between 1980-1982 was $65,500 10 years after they graduated, according to the Equality of Opportunity Project. This placed Cal Poly graduates as the fourth most successful for public university graduates in California after University of California, Los Angeles ($65,800), University of California, Berkeley ($67,900) and Cal Maritime ($85,800). Nearly 54 percent of students who originated from the bottom 20 percent of family incomes rose to the top 20 percent of graduate incomes about 10 years after graduation. Almost 4 percent of graduates from the bottom 20 percent rose to the top 1 percent in the same period. Thus, low-income students who attend Cal Poly have a reasonable opportunity to climb the economic ladder, based on this data. However, Cal Poly’s mobility rate is still relatively low according to Equality of Opportunity Project metrics due to limited low-income accessibility. In the class of 2013, only 3 percent of students originated from the bottom 20 percent of incomes. The Equality of Opportunity Project derived its mobility rate from the, “percent of students who have parents in the Bottom 20 percent of the income distribution [who reached] the Top 20 percent of the income distribution.” By this metric, Cal Poly had the sixth lowest mobility rate among public universities in California. Comparatively, schools such as CSU Dominguez Hills and CSU Los Angeles have greater mobility rates because they are more accessible to low-income students. As framed by Armstrong in presentations and interviews, the CPOG and CPOF would attempt to address the issue of access at Cal Poly. Although Cal Poly is a top-performing CSU — so much so that former College of Science and Mathematics Dean Phil Bailey has stated that Cal Poly primarily competes with UCs, not CSUs — the implication is low-income students — and minority students by extension — do not have the same access to Cal Poly that higher-income students do. However, this goal has not negated concerns over the rapid increase in out-of-state tuition that would result from the CPOF’s implementation. Presently, Cal Poly’s out-of-state tuition is 13.4 percent greater than the CSU average. With the fee’s maximum implementation, out-of-state tuition could increase to as high as 55.5 percent greater than the CSU average notwithstanding additional unrelated fee increases. In 2016, the proportion of Cal Poly students who are not California residents was 14.6 percent, resulting from a steady increase from 9 percent in 2012. Although the fee has sparked concern over a potential drop in out-of-state enrollment, Armstrong maintains that the fee proposal is feasible based on market research. The CPOG and CPOF remains in the proposal stage for now, with a potential roll-out as early as Fall 2019 following major revisions to the fee structure based on student feedback announced by Armstrong May 31. Aidan McGloin contributed to this article. Correction: The original article stated that Cal Poly was the third most expensive public university for low-income students. It has been updated to specify that this is when compared to Californian universities.